Fishtail Air recover body of Malaysian climber from Mt Ama Dablam ! Fishtail signs with the first Airbus Helicopters HCare Smart Contract! Simikot Inbound and Outbound (Hilsa Mission)! Fishtail is participating in HTM 2017! Mountaineer, 86, dies attempting to reclaim title of oldest to climb Everest! Ueli Steck's remains airlifted by Fishtail Air! Farewell to Heli Linth Family! Fishtail’s New Heli ‘9N-AJR’ has started its first commercial flight! Fishtail Air's Newest Heli is ready to operate in Nepalese sky! Fishtail Air’s new AS 350 B3+ (9N-AJR) helicopter has arrived at TIA! Safety Road Show Seminar for Fishtail Air by Airbus Helicopters! Fishtail Air team congratulates Sabin Lama for his first Solo flight! Fishtail Air to welcome new choppers in the family real soon! Fishtail Air, and integral support for the Mountain Expeditions in Nepal! Fishtail Air facilitated the world's most elite Adventure Everest Skydive! Natural Calamity: Fishtail Air leads the Rescue Operation once again! Congratulations Sujal Shrestha for your first Solo Flight! Fishtail Air team congratulates Ranjan Limbu for his first ever solo flight! Flying with the Hydropower Equipments- Development is now achievable! Romanian Climber rescued from Daulagiri! Fishtail Air and Goma Air coordinate to boost the Adventure Tourism of Nepal! Fishtail Air: An exclusive partner with Everest Skydive 2013! Hat-trick of healthy baby born onboard with Fishtail Air! Brief summary of our Spring season 2013! Fishtail Air and Simone Moro carry out the highest Helicopter Rescue!! Fishtail gear up for the Rescue mission! Fishtail Air's newest helicopter -Airborne! PATA, Nepal Chapter elects Mr. Suman Pandey as a new leader! Fishtail Air bags first prize in ICAO photo competition! One more feather in the hat of Fishtail Air! Everest Skydive Flights by Fishtail Air! Avalanche at Manasalu Base camp swept away expedition members! Fishtail Air flies foreign & domestic revelers during Namche Festival! Jubilant Everest Summitteer Prakash Dahal returns to Kathmandu! A Very Extreme Long Line Rescue From 6380m! Rescue from Everest Camp 2! Rescue from Pangpuche Base Camp! Fishtail Air's New helicopter 9N-AKA (AS350B2)! New Addition to Fishtail Air's fleet! Woman gives birth on board helicopter! Ama Dablam Base Camp Rescue! Rescue Flight from Damodar Kunda Area! Recovery flight from Machermo Area! A Russian Excursion with Fishtail Air! Short hike proves baneful for Australian. Cargo shuttles in the Karnali zone! Support to Madym Khola mini hyrdo - Consumer Committee! Pilgrimage tour to Damodar Kunda. Visit our Gallery for the ultimate collection of photographs. Summit Helicopters Pvt. 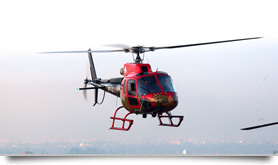 Ltd. has been taking the leading role in the field of Helicopter charter industry in Nepal. It has been operating, one AS 350 B3e "Ecureuil", one AS 350 B3+ "Ecureuil" and one Bell 206B III Jet Ranger helicopter. The AS 350B series (AS 350 B3e, B3+) of helicopters are all products of French helicopter manufacturing company Eurocopter. These are considered to be the best and strongest among the lightweight helicopters ever produced. AS 350 B3 chopper can reach where no lightweight helicopter can fly to. It can land upto an altitude of 23,000 ft. which makes it a veritable life-saver during high altitude rescue operations. Bell Jet Ranger is a lightweight helicopter manufactured by Bell Textron Helicopters, USA. This aircraft has proved to be ideal for sightseeing and heli trekking flights to the Nepal Himalayas. These aircrafts are regarded to be the most versatile and safest among light weight choppers. They can easily take off and land in a minor space and marginal weather conditions, making them apposite for mountain flying and all types of helicopter missions.